With the arrival of the new range of SHIELDskin CHEM™ safety gloves, SHIELD Scientific offers a level of “compliance, comfort and protection” that has never before been achieved. SHIELDskin CHEM™ gloves have been specially designed for laboratory use and in order to protect you from chemical hazards. SHIELDskin CHEM™ safety gloves are classed as Category III PPE according to the PPE Directive 89/686/EEC and as such are designed against the mortal and the irreversible risks. 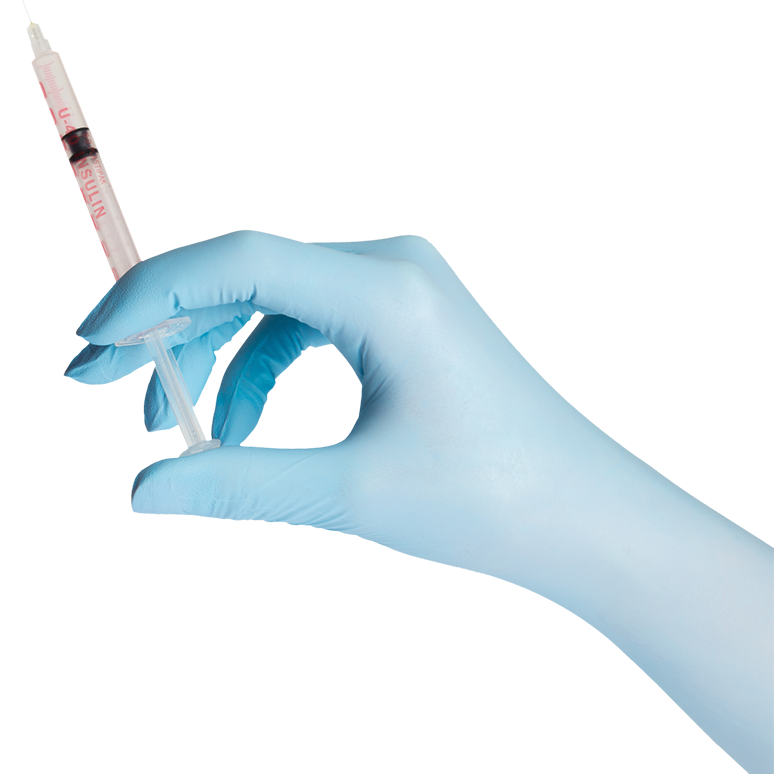 Only Category III PPE gloves are likely to offer laboratory personnel the necessary level of protection. 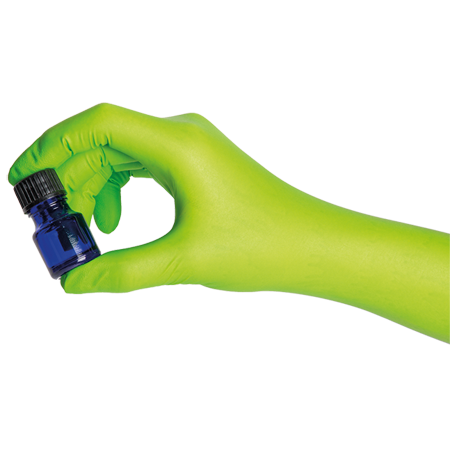 The polychloroprene/nitrile formulation is totally new and the double-dipping process known as twinSHIELD™ technology. SHIELDskin CHEM™ safety gloves have been specially developed to protect users from chemical hazards, without compromising dexterity and comfort. With a length of 300 mm/12”, SHIELDskin CHEM™ safety gloves meet the minimum liquid proof length requirement needed for a glove offering protection from chemical hazards as specified in EN 374-1:2003. They resist permeation for at least 30 minutes in 4 out of the 12 chemicals listed in EN 374-1:2003 (tested according to EN 16523-1:2015). SHIELDskin CHEM™ safety gloves have an Acceptable Quality Level (AQL) of 0.65 according to EN 374-2:2014 Level 3. This is the highest level of protection, thereby giving users an increased level of confidence in their biosafety procedures. 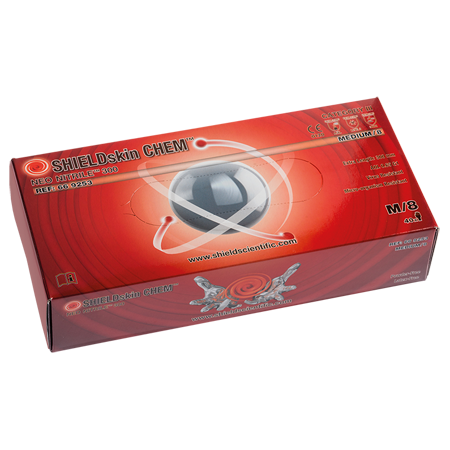 SHIELD Scientific avoids using a mixture of chemical accelerators in the manufacturing process. By using only one specific chemical accelerator, the risk of type IV allergic contact dermatitis (or type IV hypersensitivity) is limited. Furthermore, there are non-detectable levels of chemical allergens using aqueous solution extraction (Phosphate buffered solution) and High Performance Liquid Chromatography (HPLC) assay method for quantitative analysis. SHIELDskin CHEM™ gloves are latex-free and therefore the risk of a type I allergy (or type I hypersensitivity) to latex protein is completely eliminated. 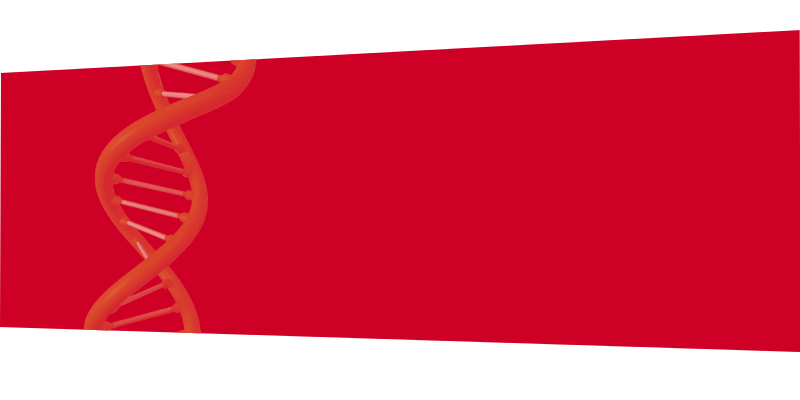 Brand signature: Red for chemical risk. 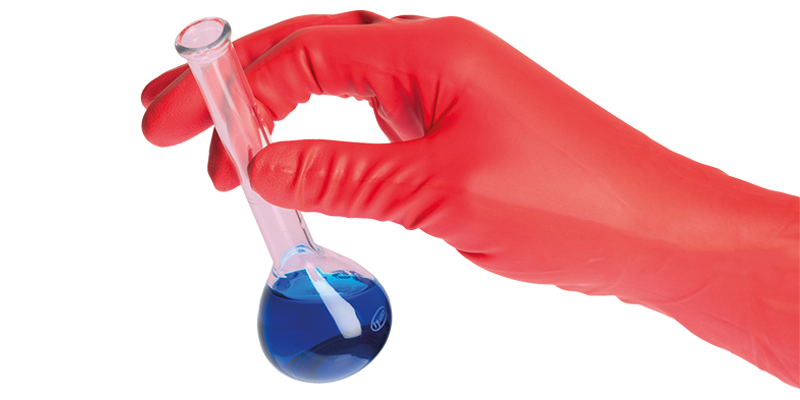 Laboratory gloves for chemical protection. Category III PPE gloves (Council Directive 89/686/EEC). Extra length from 300 mm (exceeds EN 420:2003 + A1:2009). Biosafety: AQL 0.65 (EN 374-2:2014 Level 3). Virus resistant (ISO 16604:2004 Procedure B and ASTM F1671-97b). Extensively tested for chemical permeation (EN 16523-1:2015 supersedes EN 374-3:2003). Reduced risk of allergies . 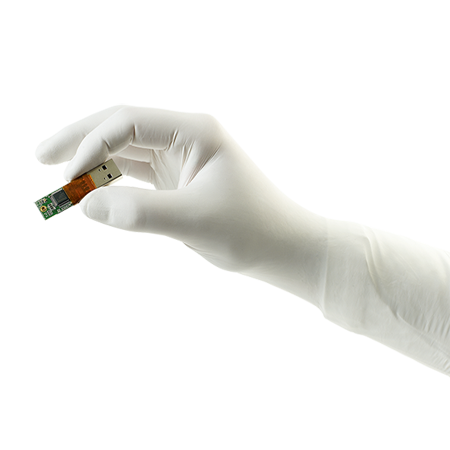 Packaging designed to comply with laboratory environments processes. Double-walled protection afforded by the twinSHIELD™ technology. 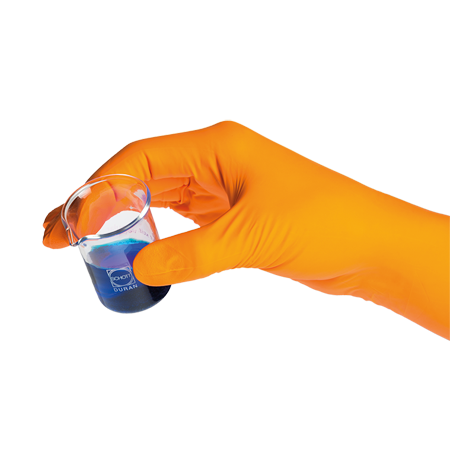 SHIELDskin CHEM™ are multi-layered gloves offering protection against chemicals in the laboratory. They meet the EN 16523-1:2015 (supersedes EN 374-3:2003) norm requirements and they meet the high expectation of users for comfort & dexterity. 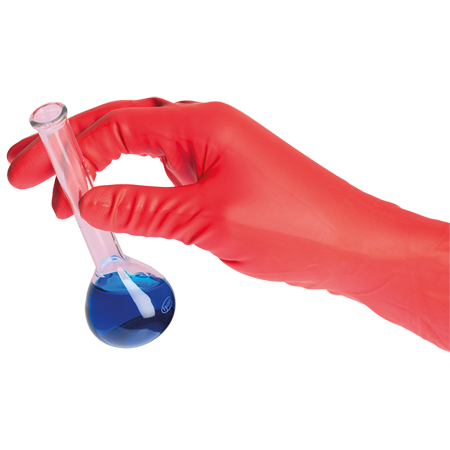 Protective glove, laboratory glove, chemical glove - Category III PPE glove - Ambidextrous powder-free red/white polychloroprene/nitrile glove - AQL 0.65 - Long cuff.